Kay Bojesen's wooden Dachshund dog is made with walnut wood. 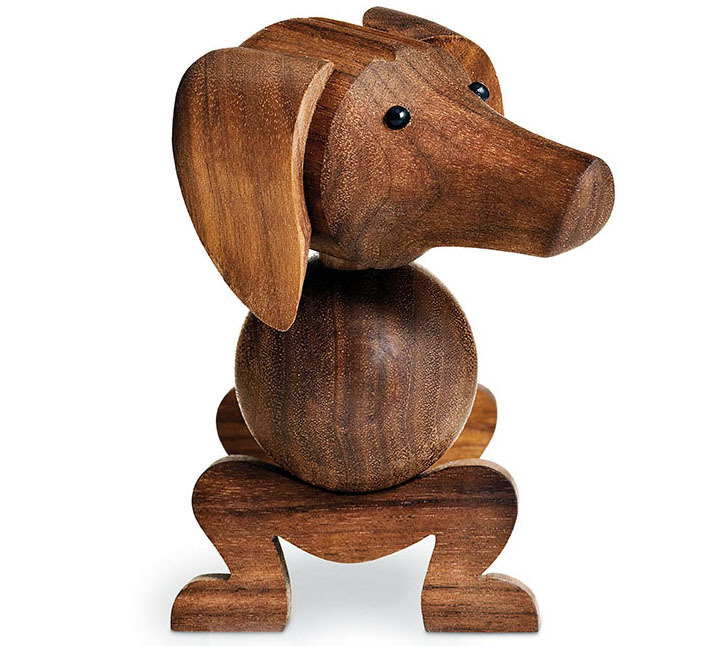 This happy wooden toy dog is cute as a button and is the perfect present for young and old! This classic design toy will provide joy for many years to come. 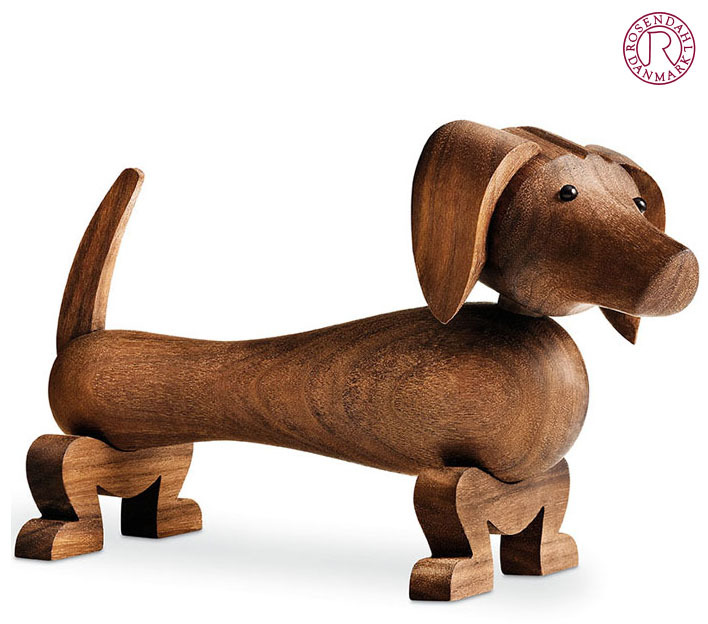 The Bojesen Dachshund is a genuine piece of modern Danish design made with superior craftsmanship in Denmark. 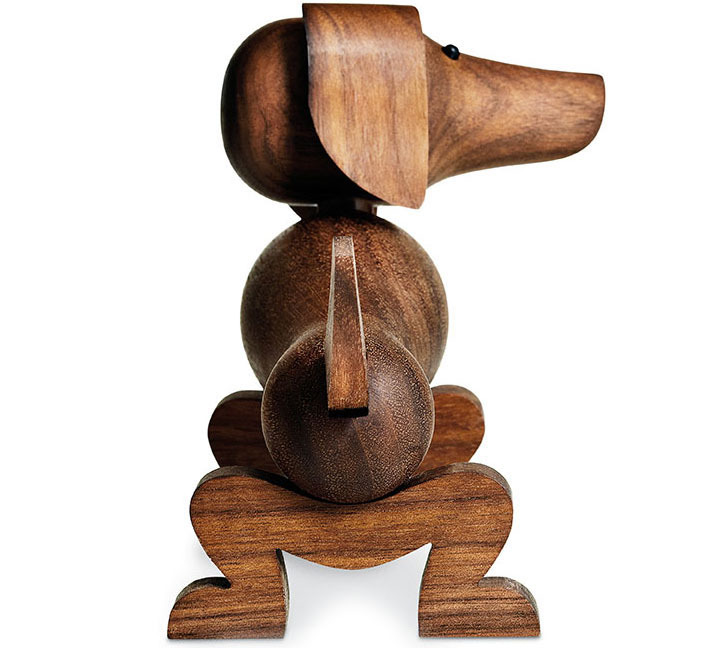 The wooden dog from Rosendahl is part of a collection from wooden animals that were created by the legendary Danish designer Kay Bojesen between 1935 and 1957. Despite the fact that the wooden dog from Rosendahl should not be understood as a copy from a real animal (no need to go out for walks 3 times a day), it possesses a strong personality full of life: irresistibly it stands and waits for the stick to be thrown or a falling delicacy. That is how the wooden dog from Kay Bojesen is placed in the unique limit area between fantasy figure and design object. Full of soul, humour and handicraft art it is an appeal to the playful child in each one of us. The wooden dog from Rosendahl possesses a pure, modern expression without unnecessary forms abd delights with its timeless design young and grown up people. But not only in the children's room, but also in shelves and offices, the wooden animals from Kay Bojesen are meanwhile desired collectors items that are passed from one generation to another. Therefore the animals are perfectly made for gift-ideas, everywhere life and game is: baptism, birthday, confirmation, graduation, marriage, anniversary. Kay Bojesen Dog: Man's Best Friend! Rosendahl manufactures the Kay Bojesen wooden animals in tight cooperation with his family out of high quality oak wood and walnut that wins charm with passing years. Bojesen himself has paid homage to the mantra that good design should be human, warm and vivid, during his whole life: ”They should remind of a circus”, is how he used to describe his works, from which his lovingly wooden creatures count to the most popular ones.